In asterCRM config file: astercrm.conf.php, it provides a option, with the option, you can set the information displayed in the agent work page. 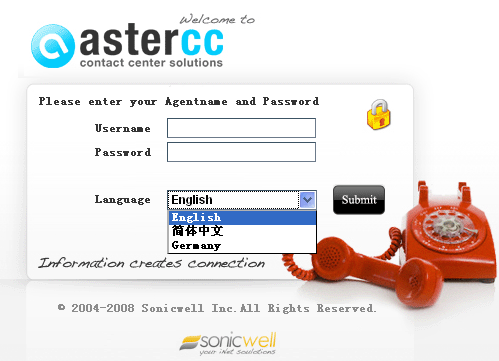 For now asterCRM provides user two languages, English and Simplified Chinese, if you want to add a new language, follow this article you can make it yourself. select Germany and login, and we go to next to change words. dont copy from en_US file coz for some words we have English as default in pages, so it could be not integral in the language file, en_US files could be used as reference. save the file with format UTF-8 when you finish. translate one by one …, not much but need some patient untill all finish. The last thing, change all images, go to astercrm/skin/default, you can see folders like “images_cn”, “images_en”.. copy images_en as images_de then modify all images in the folder. refresh your browser then you can see asterCRM with your translation! asterCRM support goolge map, so you can add a map for your customer using this feature.